To begin each session, the facilitator will orient the participants by reading a segment of the GOBLIN story. This narrative is meant to contextualize the encounter that will be experienced during the session. Following (and sometimes intertwined with) the narrative, is the game session. This portion of GOBLIN is a battle between the workshop participants and a set of foes for the session. The foes are non-player characters meaning that they are not controlled by or representative of a single human player. Rather the foes are controlled by the session facilitator. The game is meant to introduce various elements of game-based learning and gamification to the workshop participants, and it serves as a common point of discussion. As such the game generally lasts for thirty to forty minutes out of the ninety minute workshop session. The game portion should be fun, challenging, and (usually) winnable. To play the game, each player will choose a character representing a unique class/style of play. Each class has different ratings in attack, defense, speed and magic, and each has unique special skills. All characters start off at the same overall level, so players may want to choose their character based on artwork, class familiarity, or style of play (defensive, aggressive, or team based). In each battle, physical attacks compose a majority of play. One character attacks, the other defends, and the defender takes damage. The amount of damage is determined by the mathematical difference between the attack score and the defense score. 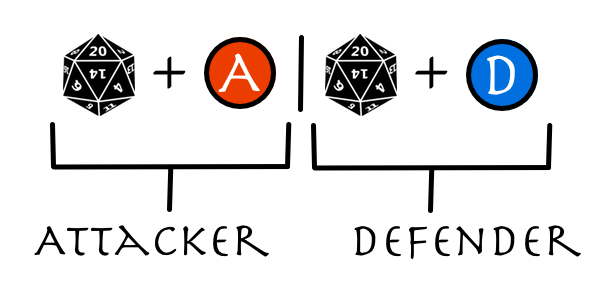 The attack score is calculated by rolling a 20-sided die and adding the result to your character’s attack rating. Similarly the defense score is calculated by rolling a 20-sided die and adding the result to your character’s defense rating. This notation can be read as the result of a die roll plus the attack score as compared to the result of a die roll plus the defense score. The attack score minus the defense score is number of points of damage dealt. If the defense score is higher than or equal to the attack score, the defender takes one point of damage, representing the physical exertion and mental strain of being attacked. The damage is subtracted from a character’s health points. Once the character reaches zero health points, she is rendered unconscious and cannot participate further in the battle. She will be allowed to heal and resume play for the next battle. If a player is attacking a foe, she will roll for attack, and the facilitator will roll for defense. When it’s the foe’s turn to attack, the facilitator will roll for attack and the player will roll for defense. Speed dictates the turn order. All characters (both players and foes) in a battle will be sorted by speed. The character with the highest speed will take their turn first and will be followed by the character with the next highest speed until all characters have had a turn. For example, if there are four players and ten foes, the fourteen characters will be sorted by speed and all fourteen characters will take their turns in order of highest to lowest speed rating. Speed also determines the number of actions a character can take per turn. At the beginning of the game, all players will have speed ratings below 15, and they will be able to take one action per turn. As your character becomes more powerful, their speed rating will increase. Once your character achieves a speed skill rating of 15, you will get a second action per turn. This second action can be used to perform a second attack on the same target or on a different target. 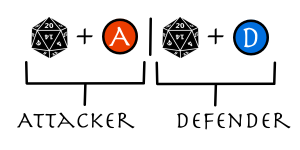 If you choose to use both your actions as attacks, your attack score will be calculated by adding your attack rating to two dice rolls while your target’s defense score remains their defense rating plus one die roll. Alternatively, you could use this second action instead to perform your character’s active skill. If/when your character reaches a speed rating of 30, you will gain a third action per turn. You will gain another action per turn each for every 15 points of speed skill rating. We have already discussed the basic mechanics of attack and defense. 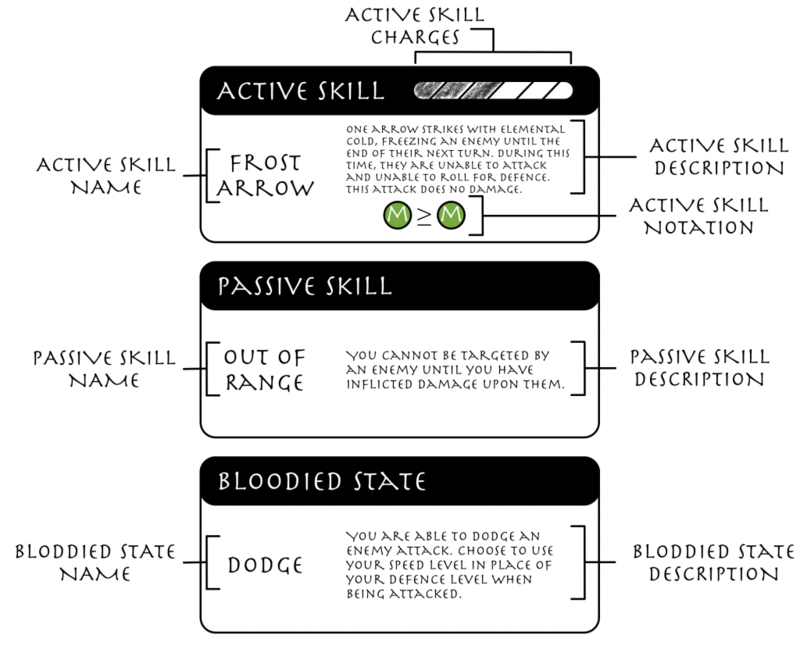 As an alternative to the basic attack, a character can perform their unique active skill as indicated on the back of their player card. All characters who are level 25 or higher will have an active skill. In the example of the rogue (shown above), the active skill is called Frost Arrow. 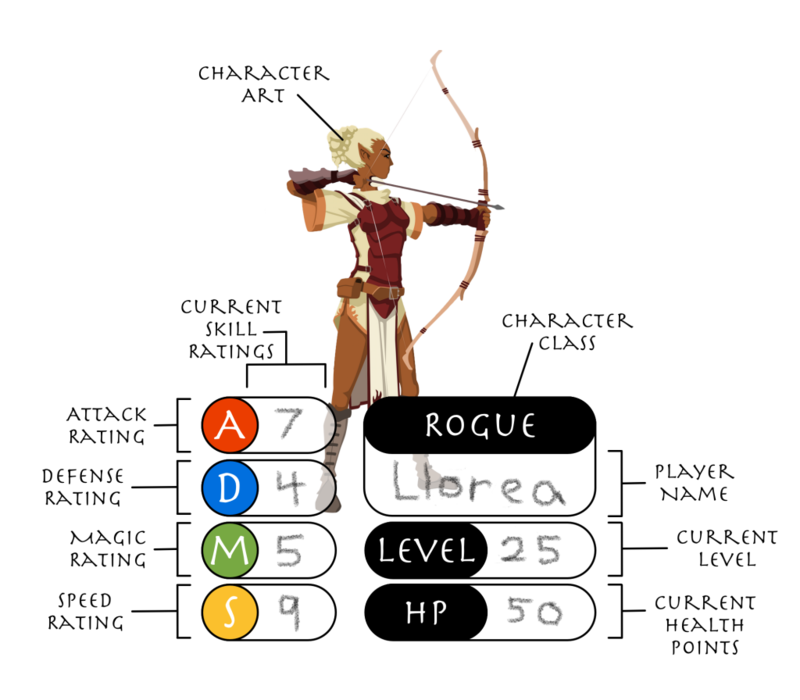 If the participant playing as a Rogue chooses to use her active skill, she will compare her magic rating to that of her targeted foe. If the Rogue’s magic rating is higher, the targeted foe will be frozen, rendering it unable to attack or defend until the end of it’s next turn. Many of these active skills are powerful attacks. For example the barbarian character’s active skill is a shield bash. If that player chooses to use the shield bash active skill, they will roll a die and calculate their normal attack score, but the defender is not allowed to roll a die. Rather the defense score is based only on the foe’s defense rating. Thus this attack will usually result in significantly more damage than a standard attack. Some characters active skill shifts the focus from attack and defense ratings to magic ratings. For example the Sorceress’s active skill is called Lightning Bolt. To calculate the affect of her attack, she would roll a die and add the result to her magic rating. The targeted foes (this active skill attack targets two foes instead the usual one) would calculate their defense by rolling a die and adding it to their magic skills (rather than their defense skills as in a normal attack). The Sorceress character will usually have a much higher magic rating than her foes, so this will often result in a high amount of damage. Some characters like the cleric do not attack with their active skill. Rather the cleric’s active skill is to heal one of the members of her party. Rather than attack, the cleric would roll a die and add her magic rating. The total would be added to the health points of whichever party member is targeted. The magic and speed ratings of characters are most important in how they enable powerful active skills. The magic rating also determines how often you can perform an active skill. Every character begins the game with the ability to use their active skill three times a day. 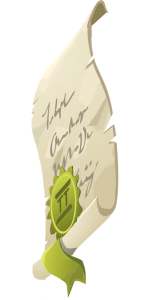 Characters who reach a magic skill rating of fifteen gain an additional use of the active skill for a total of four per day. Characters gain an additional opportunity to use their active skill for every fifteen points of magic skill rating. Only those players at level 30 or above can use their passive skill. Like active skills, passive skills are indicated on the back of each character card. Passive skills are things that the character does without having to take an action. For example the half-giant’s passive skill is called intimidation. Because of the size and scariness of the half-giant, the first foe to act in a battle, must attack the half-giant rather than any other heroes. 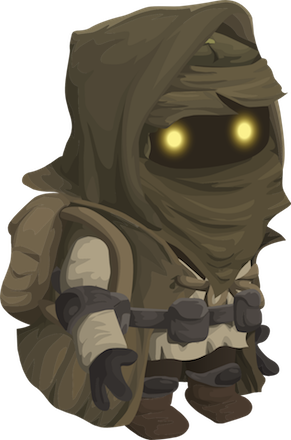 This passive skill will have a significant impact on the game in that the half-giant will always be busy in defense and should focus on increasing their defense skill level. The half-giant is also a great team player, because it allows other characters with low defense but high attack to focus on dealing damage without worrying as much about being attacked. Some characters have passive skills that allow them to modify their attacks or defenses when their dice rolls don’t go well or allow them to stay out of the fray by avoiding foes. Be sure to read your passive skill and think about how it will both affect your game play and the group. When characters have been attacked and fallen to twenty-five health points or less, they enter into a bloodied state. Injured and concerned for their life, a character will gain small advantages to their defense which could prove the difference between being knocked unconscious and staying active on the battlefield. A description of your character’s bloodied state ability can be found on the back of your character card. For example, when bloodied the halfling has the ability to dodge attacks. When calculating her defense score, a halfling character can choose to use her speed skill rating in place of her defense level when being attacked. Because the halfling’s speed rating is normally higher than her defense rating, this should decrease the amount of damage she will take at low health. Your level can be calculated by adding up all of your skill ratings. For example, if your attack, defense, magic, and speed skill ratings are all at five, then your level will be a twenty. When your party successfully completes a battle, you gain experience in the form of crystals. These crystals increase your skill ratings and your overall level. You can also earn crystals by engaging with the website for the GOBLIN faculty development community. Your total level also determines your total health points. Every characters health points before entering a battle can be determined by multiplying the character’s level by two. Thus a level twenty character will have forty health points when they enter battle. You will be responsible both for setting up the game and for making sure that everyone has fun. This may mean making battles easier or harder based on the number and experience of people playing. It will also mean thinking about how your bad guys should act, who they should attack, and what kinds of bending of the rules you want to do to create a more fun environment. For more information on how to be a Game Guide, please read the facilitation page. A video example is coming!